Starting forward Rudy Gay has missed the Silver and Black's last five games with a sprained wrist. Spurs' injury/inactive report: Guard Marco Belinelli (left knee contusion), questionable; forward Rudy Gay (sprained left wrist), probable; Chimezie Metu (G League assignment), out; forward Ben Moore (G League assignment), out; point guard Dejounte Murray (torn right anterior cruciate ligament), out; Lonnie Walker IV (G League assignment), out. With Tony Parker’s emotional homecoming game behind them, the Spurs get back to the grind of the long NBA season Wednesday night with a road game against the Dallas Mavericks. Parker, San Antonio’s starting point guard for nearly 17 seasons before signing with Charlotte last July, scored eight points and dished out four assists in the Hornets’ 108-93 victory over the Silver and Black on Monday at the AT&T Center. The loss was the second in a row for the Spurs, who hadn’t dropped two straight since Dec. 4-5. A defeat against their I-35 rivals Wednesday night would match the Silver and Black’s longest skid of the season. San Antonio (25-20) continues its two-game road trip at Minnesota on Friday, and hosts the Los Angeles Clippers on Sunday. 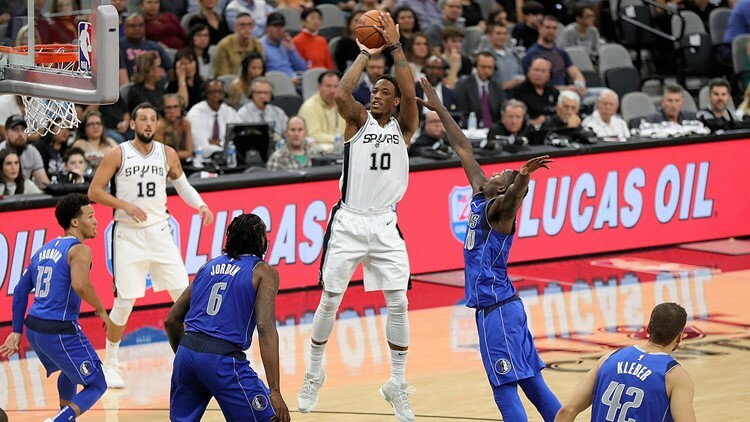 With starting forward Rudy Gay and guard Marco Belinelli sidelined with injuries, there were stretches in Monday’s game in which the Spurs struggled to score. Gay, the team’s third-leading scorer, has averaged 13.6 points, 6.6 rebounds and 2.4 assists in 35 this season. The good news for the Silver and Black is that Gay, who has missed five straight games with a sprained left wrist, is listed as probable on San Antonio’s injury report for Wednesday night’s game. Belinelli, one of the team’s top reserves and three-point shooters, has averaged 10.5 points in 43 games. He missed the loss to Charlotte with a left knee contusion and is listed as questionable for the game in Dallas. DeRozan said Gay’s absence “without a doubt” has affected the team’s offense. Aldridge talked about the contributions Gay and Belinelli make when he was asked how much the Spurs miss them. 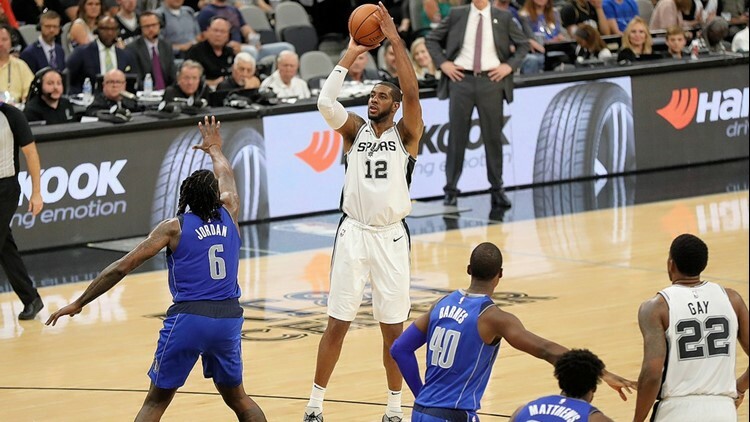 “They’re both offensive players that bring scoring, and bring other options out there, so of course you miss them,” Aldridge said. The Spurs squeezed out a 113-108 victory over the Mavs in their first meeting on Oct. 29 at the AT&T Center. Although near the bottom of the Western Conference standings, Dallas (20-23) is 16-5 at home. LaMarcus Aldridge had 20 points, six rebounds and four assists in the Spurs' 113-108 overtime home win against the Mavericks on Oct. 29. The Mavs have been carried by 19-year-old rookie forward/guard Luka Doncic, who has averaged 20.2 points, 6.7 rebounds and 5.0 assists in 42 games. Doncic, from Slovenia, has averaged 28.0 points, 6.8 rebounds and 6.0 assists in his last four games. Dallas was dealt a severe blow Friday night when veteran guard J.J. Barea was lost for the season after rupturing his right Achilles’ tendon in the second half of a road win over Minnesota. He had surgery Monday, the day after Dallas lost at home to reigning champion Golden State 119-114. Long a sparkplug for the Mavs off the bench, Barea averaged 10.5 points and 5.6 assists this season. Charlotte point guard Kemba Walker scored a game-high 33 points in the victory over the Spurs, hitting 13 of 27 shots, including 7 of 13 from the three-point line. Charlotte was ahead for most of the game and never trailed after Miles Bridges scored on a put-back dunk that gave the Hornets a 73-72 lead with 9.6 seconds left in the third period. The quarter ended with Marvin Williams draining a three-pointer from the corner, giving Charlotte a 76-72 lead heading into the final period. The Spurs shot 46.3 percent overall (38-82) and 35 percent (7-20) from the three-point line.